The Mr got a couple of these birdhouses for Christmas. They are pretty cool - made from treated cardboard, are water-resistant and seemed like a pretty fun thing for our bird-filled backyard. We put them up shortly after Christmas. In the line of sight of one of our backyard cams, so we could watch the comings and goings. Until we were outside tending the fish, looking at the plants... and I happened to look up to see sticks in the little bird door! 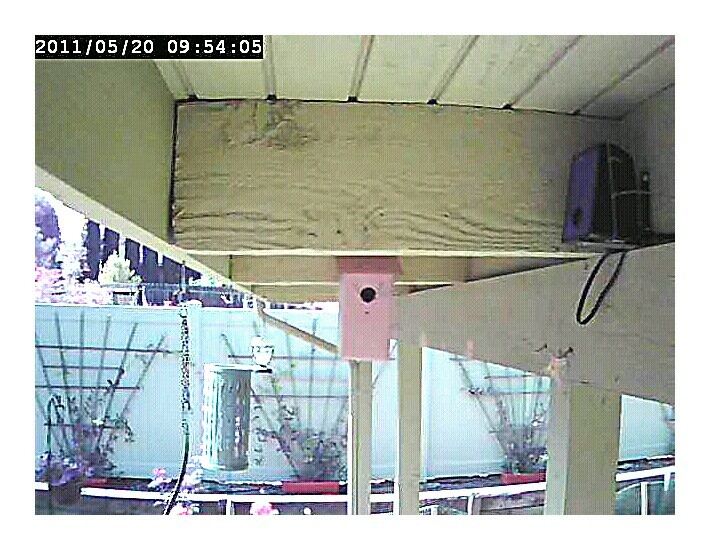 You can't see it in the picture above - a screen cap from our backyard cam, and I am a bit reluctant to get too close with a better camera so as not to disturb whoever put the sticks there.... but someone is building a nest! We'll be keep our eyes peeled (from a distance) to see who it is! Do birds nest in your yard? Tuesday Garden Party - Progress! !